United Arab Emirates, with its seven Emirates, houses the rising number of cement plants in the region. Among them is TEBA Cement Factory, UAE’s newest market entrants based in Abu Dhabi, established in 2008. It was in the midst of vast growth in cement industry when Teba Cement Factory was founded. 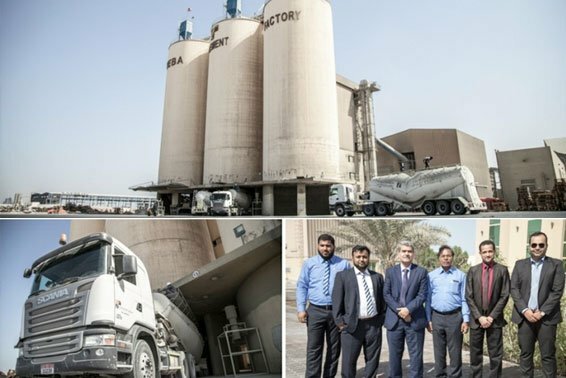 Based in Mussaffah, Abu Dhabi, Teba Cement Factory, was designed and built in accordance with the latest production and operation lines that employ modern technology. It runs a 1.2Mt/yr capacity clinker grinding plant with a design that enables expansion to 2.7Mt/yr of grinding capacity. Under the patronage and guidance of His Excellency Saeed Mohammed Saeed Albadi Al Dhehri, Chairman of Teba Cement factory, the company’s vision is to provide the highest quality cement and cement products to meet the needs of the local market in the country and eventually expanding to continuously serve the regional market. Bin Brook Motors & Equipment LLC has been partners with TEBA Cement Factory for more than 2 years. With the revolutionized cement production, Bin Brook Motors in association with Scania, have been providing solutions with their fleet and production process that enhances their output and business operations. According to Mr. Yasir Khan, BBME Sales Engineer, who has been the representative of introducing Scania products and services with TEBA, “It was truly a learning experience, I find their optimism and willingness to consider new ideas to add value in their business so I perform the standard approach by presenting various range and solutions that will benefit their business. Through constant follow-up and visits eventually I succeeded gaining their trust and later formed a good relationship”. Mr. Majid Ahmed Alanssari – TEBA Cement Factory’s General Manager for 3 years professed his experience with Scania products “We use our fleet on daily basis from Ras Al Khaimah to ICAD Abu Dhabi with estimated travel of 800 kilometers per trip. We find excellent performance of the vehicle with zero downtime until now. Mileage is also considerably good”. “We are greatly satisfied with the performance of the truck as we are maintaining it well in Bin Brook Motors facility which has sustainable After Sales services that maintains the good condition of our vehicle. They also provide prompt response to our complaints and solutions from possible breakdown which really helps us to prevent downtime”. “As of now we have a fleet of 14 Scania trucks which we are exclusively using and we are thinking to add more in future depending on the demand of our production. We find Scania trucks easy to operate, manageable in maintenance and fuel efficient which delivers excellent profit in our business”.